How does the Gribetz V16 compare with this new acceleration record-breaking car? 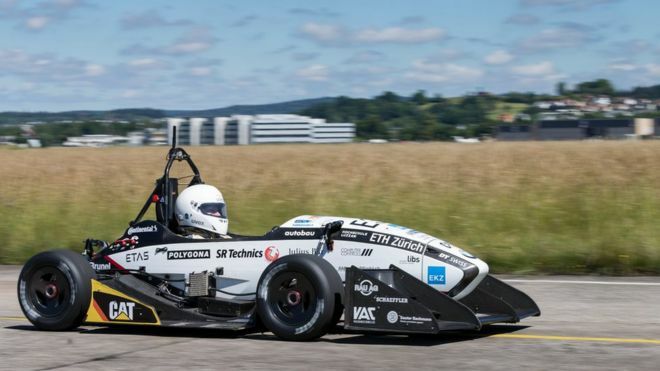 Swiss engineering students from ETH Zurich (ETZ) have developed a car that recently set a new electric car acceleration record, going from 0 to 100kph (62mph) in - don't blink - 1.513 seconds! Wow. How can it do this so fast, you ask? In other words, they eliminated any waste in the torque-producing power at each wheel. Hmmm... that reminds of another innovative speed-record machine, the Gribetz® V16 mattress quilter. Gribetz engineers designed a more lean machine unlike any other in the world and it can operate at 1600rpm on Tack & Jump® or continuous patterns. Like the Swiss race car in this story, the V16 runs with optimized torque using direct-drive technology instead of traditional chain-driven indirect power. 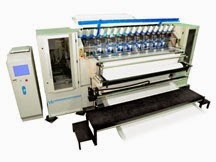 Gribetz V16 mattress quilter running at 1600 RPM compared to a 900 RPM quilter. See the full video of the V16 at the GSG website and learn of the amazing productivity gains you can enjoy quilting at 1600rpm. OK, Gribetz hasn't developed a "Where's my quilter" app yet, but let's face it: if you can't find your quilter, you must have bigger problems. But Gribetz has embraced the productivity power of mobility and developed this tablet-based HMI control device. Now your mattress quilter operator has the primary operation controls in the palm of his hand as he moves about your quilting operation. His activities are no longer restricted to his access to the machine's stationary control cabinet. Greater worker mobility is one way manufacturers are becoming more productive and this hand-held HMI tablet goes a long way toward improving your quilting operation's productivity. Click here to get more details at the GSG website!